100 Dec. 11 1922 Cary Club met Dec. 11 at home of Mrs Carrie Reickert with fourteen members present. Mrs McKean acting president, called the meeting to order. Roll call responded to with a Christmas quotation. The Guest Day Com. reported the Guest Day to be a Kensington with a 5 P.M. dinner. Each member bring ing one guest. Flower Com. 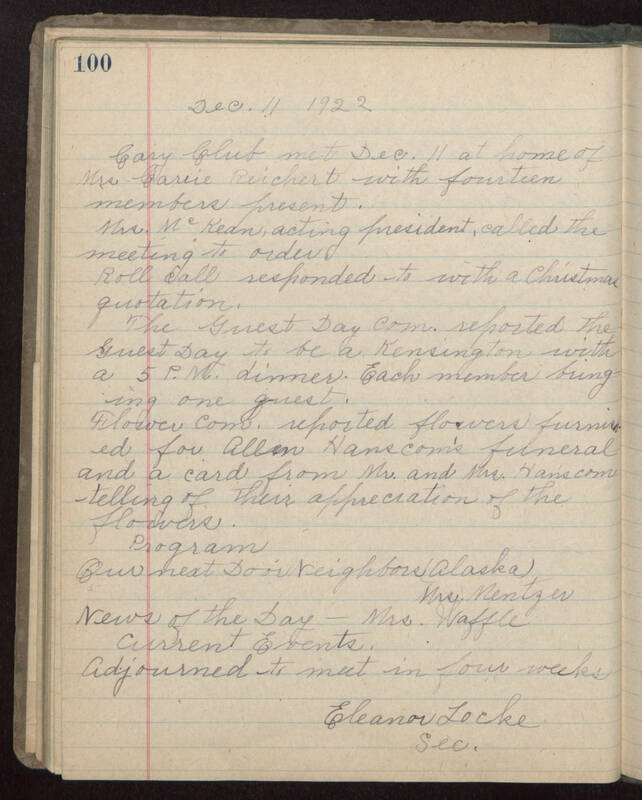 reported flowers furnish ed for Allen Hanscom's funeral and a card from Mr. and Mrs. Hanscom telling of their appreciation of the flowers. Program Our Next Door Neighbors Alaska Mrs. Mentzer News of the Day - Mrs. Waffle Current Events. Adjourned to meet in four weeks Eleanor Locke Sec.